Apple made a big deal out of the iPhone 8, iPhone 8 Plus, and iPhone X’s glass, calling it the most durable glass to have ever graced a smartphone. However, a number of drop tests have popped up in the days since its launch to prove that this was little more than marketing speak. An earlier video by YouTuber EverythingApplePro demonstrated how the iPhone 8 Plus fared when dropped by an actual person from various heights. 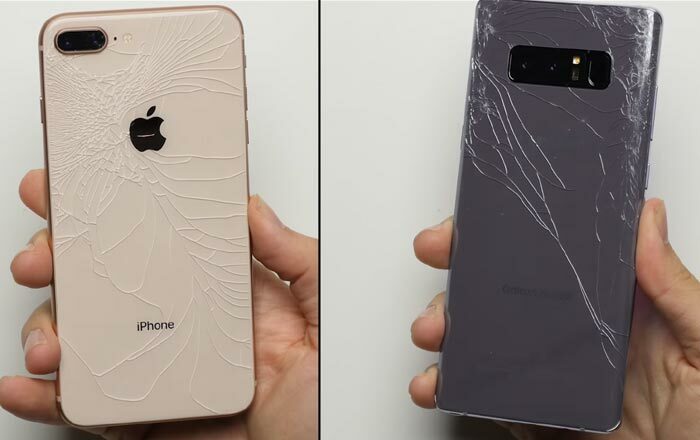 A new one by extended warranty service provider SquareTrade shows how the iPhone 8, its larger sibling, and the similarly glass-covered Galaxy Note 8 performed using drop test equipment on a sidewalk. Both the iPhones and Galaxy Note 8 splintered into various cracks and fractures on all sides when plummeted at 6 feet and 22 feet, as well as in a tumble test. In the end, the iPhone 8 got a breakability score of 67, the iPhone 8 Plus received a breakability score of 74, and the Galaxy Note 8 topped the charts at 80. These figures put the iPhone 8 and iPhone 8 Plus within the medium risk category and the Galaxy Note 8 in the high risk one. The disparity has come about because the last stopped working completely after some rounds, whereas the others continued to chug along. Another drop test video by PhoneBuff pitted the iPhone 8 Plus and Galaxy Note 8 using a professional drop test machine. The results were pretty much the same, with broken glass aplenty. However, the Samsung phone ultimately beat the Apple one in stark contrast to SquareTrade’s findings.